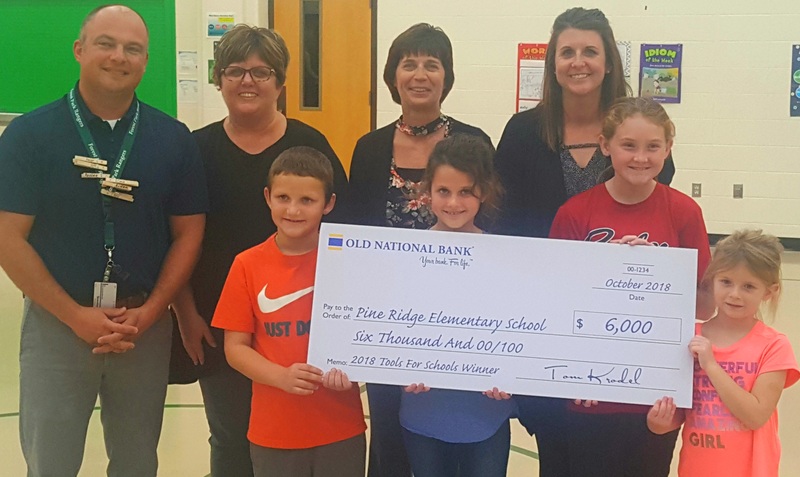 BIRDSEYE -- Old National Bank has awarded Pine Ridge Elementary School in Birdseye with a $6,000 grant. The check presentation held in the school auditorium Wednesday afternoon. Principal Ryan Haas tells WITZ the school won the grant by getting the most votes on-line. "It says a lot. It says [the community] is willing to put in the time to help us out with the things we need." The funds will go to help improve the school and the grounds around the campus. "The walking trail is going to be about a six-tenths of a mile trail that will incorporate out existing track with a connection of multiple sidewalks to create a path for out students and staff and community members to come and enjoy Pine Ridge. "This is almost becoming habit-forming here," says Tom Krodel, the region president for Old National Bank. "This school has a great amount of community pride. This year, for the second year, they are the grand prize winner." Principal Haas says the $6,000 grant is more than 10% of the entire budget for the project. He adds, the money will be very helpful.